What is the Bahai Faith and why does the UN endorse it??? One nation, under one religion!!! The United Nations is pushing the one world religion agenda and their chosen vehicle for success is the Bahai faith. The national governing body of the U.S. Baha’i community has been represented at the United Nations since 1947. The U.S. National Spiritual Assembly is a member of the Baha’i International Community, a network of 182 Baha’i national affiliates that acts on behalf of five million Baha’is worldwide and continues to grow at an alarming rate. Since 1948, the Baha’i International Community has been accredited as an international nongovernmental organization of the United Nations. It was granted special status with the UN Economic and Social Council in 1970. 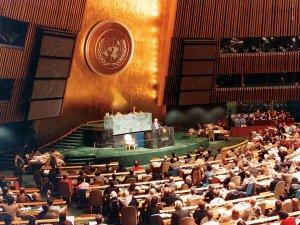 The Baha’i U.S./U.N. Office represents the National Spiritual Assembly of the Baha’is of the United States at the UN Headquarters in New York. This organization has its own office to facilitate propaganda that will one day lead to a unified one world religion. Taxpaying Christians from around the world are being forced to fund this movement. The Office collaborates with a variety of U.N offices and specialized agencies. It also engages the U.S. Baha’i community in UN.-related advocacy campaigns and works with nongovernmental organizations on issues related to human rights, social justice and sustainable development, which is just a fancy term for population control. The Baha’is’ long record of supporting representative global institutions dates back to the period shortly after World War I when a Baha’i office opened at the Geneva, Switzerland, headquarters of the League of Nations. This commitment to religious enslavement is grounded in the Baha’i principle of the oneness of humanity, which implies the establishment of a one world religion in which all nations, races, creeds and classes will be closely and permanently united in preparation for the Anti-Christ.